Jason Newfield and Justin Frankel founded the law firm of Frankel & Newfield, P.C., in 2004. The two shared a vision of a law practice that provided superior representation, combined with a compassionate approach to men and women who are having difficulties or concerns with their long-term disability insurance policies or the claim process for filing a disability insurance claim. The years developing strategies to combat the evolving nature of this practice area have provided Frankel & Newfield’s clients with an edge in pursuing these claims for benefits. The focus on aggressive representation that identifies key issues at the inception has lead clients to more often have smooth claim histories rather than suffering denials or terminations of claims. Those employing the firm at later stages receive the benefits of years of analyzing judicial decisions to best guide each case toward success. When we say “it’s not our first rodeo”, you should take comfort in knowing that we have seen your situation before. Our team works closely with our attorneys and are the backbone of our success. If you've called the office, you know that they are caring professionals who understand the special situation that our clients face. Their contributions are important to our ability to deliver top notch results to our clients, and they are vital members of our team-based approach to client service. Christina Murray has extensive experience in many different levels of the court system. Before joining Frankel & Newfield, she worked in a criminal defense law firm in Honolulu with a focus on criminal law, military law (courts-martial and UCMJ violations) and Second Amendment civil rights. Christina received a BA in Fine Arts from Adelphi University and completed the paralegal program at Boston University, where she received her Paralegal Certification. At a very young age, Christina began a professional acting and modeling career and has appeared in many feature films and television shows. Carly Comitino’s unique background in teamwork, competition and experience makes her a valuable asset to the firm. She relates well to our client base, as she understands the challenges of being injured; her military education at the prestigious United States Naval Academy was cut short by an injury. Carly also understands what it takes to win, as one of only two applicants to win out of hundreds for an apprenticeship at the construction company featured on This Old House (PBS). She completed her education at LIU Post, with a B.A. in Political Science. During her last two years of college, she interned at the International Development Law Organization, where she was responsible for reporting on high level events and meetings at the United Nations. A former member of the Navy Women’s Lacrosse Team, competing in the USNA’s division I lacrosse team, she now coaches third and sixth grade girls at the PAL Lacrosse Team, teaching teamwork and leadership. The unfair practices employed by many disability insurance companies often cause claimants tremendous emotional and financial hardship at a time they can least afford to face such challenges. Our lawyers fight aggressively to protect your rights, preserve your benefits, and prosecute bad faith denials and terminations of disability claims. For additional information about who we represent, the conditions we have represented and about long-term disability insurance companies and other helpful tools, see our resources section. 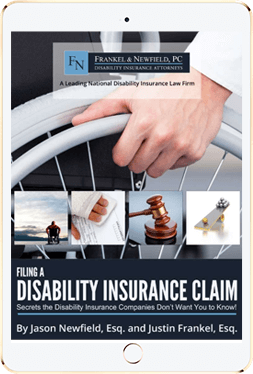 Our experience in recognizing issues before they become problems has helped prevent many clients from getting tangled in lengthy and complex disputes with disability insurance companies. Our firm's knowledge of rapidly changing laws in the field of disability insurance, and our efficient and cost-effective approach to resolving matters at any stage, is of great value to our clients. At Frankel & Newfield, P.C., you work directly with an experienced partner who will guide you through the claims process and, if necessary, through litigation. The firm has flourished because clients and their families appreciate our knowledgeable and aggressive approach to the practice of law as much as they do the level of service that Jason and Justin provide. As a boutique firm, we provide a select number of clients with highly personalized representation. We know our clients as individuals facing challenges, not as case numbers and fact patterns. Our clients appreciate the personal nature of our practice, and we believe that it makes us more effective advocates for their disability claims. From our disability law office in New York, we represent clients throughout the country. For more information about our services, call 877-583-2524 or send us an email.